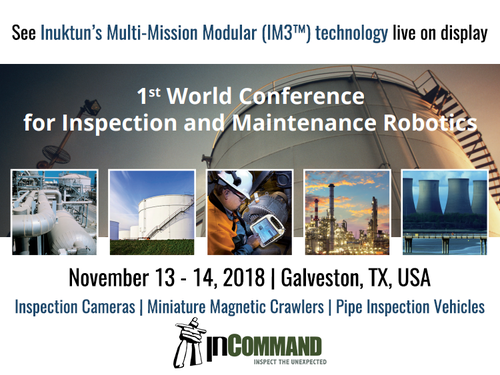 On November 13th and 14th, SPRINT Robotics is organizing the 1st World Conference for Inspection and Maintenance Robotics in Galveston, Texas, USA. Quasset will be a part of this unique event in which the global Inspection and Maintenance Robotics community will gather to share the innovative progress and rapid developments in the petrochemical industry, power generation and nuclear industry, aerospace, public infrastructure, and the next generation of technologies underway. As well as being a sponsor of this groundbreaking event, we are also exhibiting and you can find us at booth number 300. The conference program includes an impressive line-up of keynote speakers from companies such as Boston Dynamics, Intel, BP, Chevron, Dow Chemical and UKAEA RACE, as well as presentations from more than 50 international specialists active in the capital-intensive infrastructure domain. Each conference day will conclude with a dynamic plenary panel session. On the first evening a Conference Banquet will be held in which the SPRINT Robotics Award 2018 will be announced and presented. A GAP Analysis Workshop (organised in cooperation with ASME) is scheduled for the second day of the conference. In addition, this conference offers exhibitions and demonstrations of state-of-the-art technology by more than 35 leading service and technology providers.